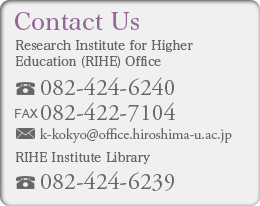 RIHE launched Japan’s first Master’s* and Doctoral programs in university and higher education in order to nurture higher education researchers and experts. In 2000, it established the Master’s Program in Higher Education Development and the Doctoral Program in Education and Human Science. In accordance with the organizational reconstruction of the graduate school in 2016, RIHE launched the new Professional Development Program for Teachers and School Leaders and the aforementioned courses were renamed the Program in Higher Education and the Program in Education and Learning Science respectively. *At the end of the program, master candidates can choose the title of the degree, Master of Education or Master of Arts. Applicants for both Ph.D. and Masters programs are required to take in person an entrance examination at Hiroshima University. The examination consists of two written parts: special subject for higher education studies and Japanese for foreign students and an oral examination on your research project. It is administered in September and February. Applicants who pass the examination matriculate into the programs at the beginning of April in the next academic year. *For details of the entrance examination, please refer to the following pages (jump to the Graduate School of Education website).